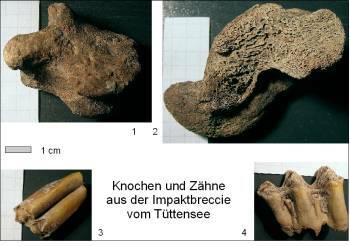 Bones and teeth from the impact layer (ejecta, Bunte breccia) at Lake Tüttensee (Chiemgau impact event). In numerous excavation pits around Lake Tüttensee, a polymictic breccia layer has been encountered to be probably impact ejecta from the Tüttensee crater ( http://chiemgau-impakt.de/ATT00007.pdf ). In a clayey matrix, the breccia contains multicolored rock fragments exhibiting shock-metamorphic effects (http://chiemgau-impakt.de/bdw3.pdf ), and is rich in organic material like wood and charcoal. Moreover, bones, bone fragments and teeth were found in the breccia from four excavation pits. Meantime, for two bones and two teeth a more accurate determination has been performed by Dr. M. Mäuser, director of the Naturkundemuseum (Museum of Natural History) in Bamberg. Bone 1 (excavation 11; image 1) is a cattle’s second phalange (toe bone). Bone 2 (excavation pit 11, image 2) belongs to the left astragalus (talus bone of the ankle) of a deer, probably a red deer (possibly a fallow deer). Tooth 1 (excavation 25, image 3) is an upper-jaw molar of a goatish (Caprinae). Caprinae include sheep and chamois but also goats and the ibex (capricorn). The size of the molar speaks in favor of a sheep or an ibex. Tooth 2 (excavation 25, image 4) probably is a Caprinae milk premolar.